Description: The Pallid Bat (Antrozous pallidus) has a light yellow pelage with patches of brown or gray. On its face are pale purple wartlike bumps, the purpose of which have not been discovered. About the Pallid Bat: Pallid bats mostly roost in caves and crevices, but abandoned buildings and bridges serve as good roosts as well. Males and females are separated into bachelor and maternity colonies. 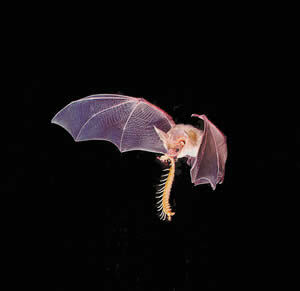 These bats typically feed on insects that are greater than 17 mm in size, whether that insect be a flying one or not. If it is a flying insect they will force it against the ground and trap it with it’s wings, an unusual strategy among bats. Females normally birth twins.